More sophisticated disco influenced gems from this great fledgling label…The Elevator People are back, introducing EP 003 by Giulio Dj! Giulio Dj, also called Julian Horn by his mum, started his tuneful career dj’ing in Vienna about 8 years ago, bringing his love for authentic Disco, Balearic Beats and Cosmic Leftfield Sounds to local Music circles. Julian’s productions reflect the warmth of 70s ‘n 80s Disco with a wide range of influences from Chicago to contemporary House Music. 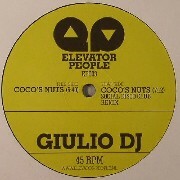 His first release on Elevator People is a dirty mid-tempo floor filler called Coco’s Nuts that will work well on the more sophisticated dance floors and will go just as well with your hamburgers during those summer BBQ’s Portuguese Don “Social Disco Club” takes it up a notch and delivers a sweet House remix with a little acid on the side.